"During CPS [Child Protective Services] involvement, I felt like I had lost control. I had to have their permission for everything. 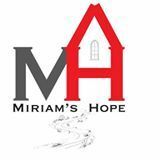 We lived in motels, with friends, near strangers, and in a condemned house ... God then brought us to Miriam's Hope. Life has never been better. I was given so much more than a home. I was blessed with an amazing church family, mentors who have givcen so much in so many ways, and time to resolidify my bond with my kids." It is these statements that make our work worthwhile. Please continue to pray for us as we seek to establish in a permanent location, wherever God has that to be. Consider becoming involved with your time, prayers, or finances.